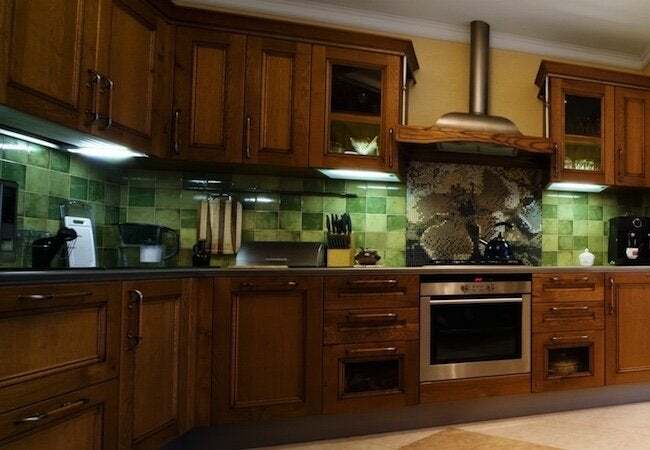 If you love everything about your wood cabinets except for their color, forget about spending a small fortune to replace them with a brand-new set. Instead, refinish the boxes, doors, and drawers with a stain that brings out the natural beauty of the material. Here's how. Of all the reasons to appreciate solid wood cabinets, there may be none more appealing than their virtually endless changeability. That is, if you ever tire of the cabinets’ appearance, you can always refinish the wood, transforming the overall look of your kitchen or bath in the process. Of course, the size of the project depends on a number of factors. But generally speaking, you don’t need to be an expert to stain cabinets successfully. With only a handful of basic tools and materials—and in many cases, the willingness to make a mess and clean it up—almost anyone can achieve pro-quality results, without having to hire a contractor. The process always starts out the same way, even if your cabinets are new and unfinished. Remove the cabinet hardware (including the hinges) and set the doors aside. You can leave the cabinet frames in place, but take special care to protect the rest of the room with drop cloths or plastic sheeting. Once you have prepared the work area, give the cabinets a thorough cleaning. First, rub them down with a clean cloth and mild detergent, then follow up with plain water to eliminate soap residue. Note: There’s one situation when it’s not necessary to spend time cleaning at the outset. That’s if the existing cabinets are painted or stained and, rather than use a chemical stripper, you’d prefer to scrape and sand away the existing finish. Here, you can skip the cleaning and proceed directly to the second step. Unless your cabinets are raw wood, the existing finish must be removed before you can apply the new stain coat. There are two ways to go about it. If you’re only dealing with a few cabinets, it may be simplest to handle the job the old-fashioned way, without resorting to a chemical stripper. But if you’ve got a number of cabinets to refinish, a chemical stripper can save you a great deal of time and energy. Stripping products have improved over the years, but it remains important to pay close attention to any warnings included with your chosen product, be it a liquid or gel. Ventilation is a must, and manufacturers typically also recommended that do-it-yourselfers wear the appropriate protective gear (gloves, at minimum). Also, remember to cover any surfaces you don’t want to strip (painter’s tape is handy for the purpose). Once you’ve properly prepared, apply the stripper according to the included instructions. Normally, stripper takes about a half hour to set in. After that, the finish ought to come off easily with a scraper. But bear in mind that with a stubborn finish, it may be necessary to use multiple applications of stripper. Once you’ve taken off the old finish, move on to sanding the cabinets with 80- to 120-grit sandpaper. If you have access to a palm sander, capitalize on its ability to make quicker, easier work of what would otherwise be a taxing, time-consuming step. As you would in any other project, sand in the direction of the wood grain until you have the cabinets surfaces are smooth and even. Along the way, you may wish to repair any imperfections (cracks or scratches) that you notice in the wood. Finally, finish up by sanding the cabinets again, this time with 150- to 220-grit paper. Vacuum the sanding dust, and before you continue, wipe down the wood with a moistened cloth to pick up any lingering debris. Let the wood dry. The staining portion of the project begins, not with stain, but with wood conditioner. Conditioning helps ensure that the stain adheres evenly and looks its best. Much like stain itself, wood conditioner goes on with a paintbrush. If the cabinet and doors feature inset paneling and other details, opt for a small brush capable of reaching all the little nooks and crannies. By the same token, if all the cabinet surfaces are flat, you can safely stick with a wider brush. No matter the style of the cabinets, completely coat their surfaces with a thin layer of the conditioner. Once the cabinets are dry, lightly scuff them with #000 steel wool. Now it’s time to apply the stain. Unlike paint, the appearance of any given stain partly depends on the type of wood to which it’s being applied. For that reason, it may be wise to test your chosen stain somewhere inconspicuous before you apply the product all over. Reserve your judgment until the test stain has dried. Assuming you like what you see, go ahead and apply the stain using either a paintbrush or a clean, soft rag. Work in the direction of the grain and aim, not only for complete coverage, but for a light, even coating. As you go along, you may notice one or another section looking darker than the rest. Don’t worry: You can lighten things up by rubbing off the excess stain with a fresh rag. Once you’ve coated every cabinet surface, wait for the stain to dry. That may take a day or two, depending on the humidity. During that time, be careful not to let dust or dirt land on the cabinets. 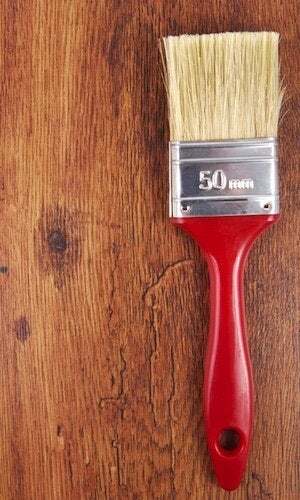 Once the stain has fully cured, assess whether or not you need a second coat. If you were envisioning a lighter color, you may be able to get away with one coat. Otherwise, expect to apply at least two coats. Between coats, don’t forget to lightly scuff the cabinet surfaces with steel wool. Repeat the process a third time if the stain color still hasn’t darkened enough to match your taste and expectations. Today, some products combine stain and polyurethane for one-step finishing. If you happen to have used such a stain-sealer hybrid, well, congratulations—you’re finished. 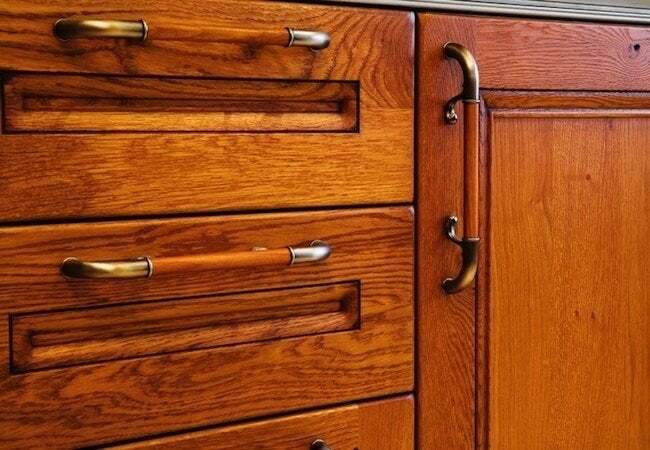 If you opted for a traditional stain, you don’t strictly need to seal the cabinets, but considering the inevitable wear and tear, it’s probably a good idea. Polyurethane sealer goes on with a paintbrush, and as is the case for stain, two thin coats are much better than a single thick coat. Before applying the initial coat of sealer, consider that polyurethane tends to accentuate any surface imperfections. If your cabinets aren’t perfectly smooth, you may wish to sand them down again. After sanding, use a moistened cloth to remove all the dust. Once the cabinets are clean and dry, stir the polyurethane and apply it in long, overlapping strokes. So long as you concentrate on keeping the application thin, the sealer isn’t likely to pool or drip. Next, wait for the sealer to cure—and while you’re waiting, take pains not to let any dust or debris settle on the drying cabinets. After the recommended dry time has elapsed, return to the cabinets and, for the smoothest-possible finish, sand the cabinets one more time (or lightly scuff them with steel wool). Remove the sanding dust, and once the cabinets are dry, apply the final sealer coat. Re-hang the cabinet doors and put the knobs or pulls back in place (or seize the moment and install replacement hardware). Then stand back and relish the upgrade you’ve given to your old cabinets, and how, in turn, their new look has imbued the rest of the room with a new and exciting character.